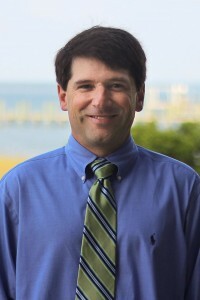 John Fear is deputy director of North Carolina Sea Grant and the Water Resources Research Institute of the University of North Carolina system. He focuses on developing and executing research portfolios for the two interinstitutional programs. He works to increasing the links among the research, extension and communication sections of both organizations, with a special emphasis on creating new student engagement opportunities. Fear worked as research coordinator for the N.C. Coastal Reserve and National Estuarine Research Reserve program within the N.C. Division of Coastal Management for nine years. In this role, he conducted original research and facilitated studies by partners at the 10 sites of the NCCR-NCNERR and their respective watersheds. Prior to that, he was a postdoctoral fellow at the University of North Carolina at Chapel Hill’s Institute of Marine Sciences. Fear chairs the core management team for the North Carolina Sentinel Site Cooperative, a multiagency partnership established as part of a National Oceanic and Atmospheric Administration effort to provide coastal communities and resource managers with information on potential impacts of sea-level rise on coastal habitats. He also is a member of the Criteria Implementation Committee, which works with the Department of Environmental Quality’s Division of Water Resources on the state’s Nutrient Criteria Development Plan. A native of New Bern, NC, Fear holds a doctorate in environmental sciences and engineering from UNC-CH‘s School of Public Health, and a bachelor’s degree in biology and chemistry from UNC-CH. In his spare time, he enjoys fishing, family time and tinkering with anything mechanical.